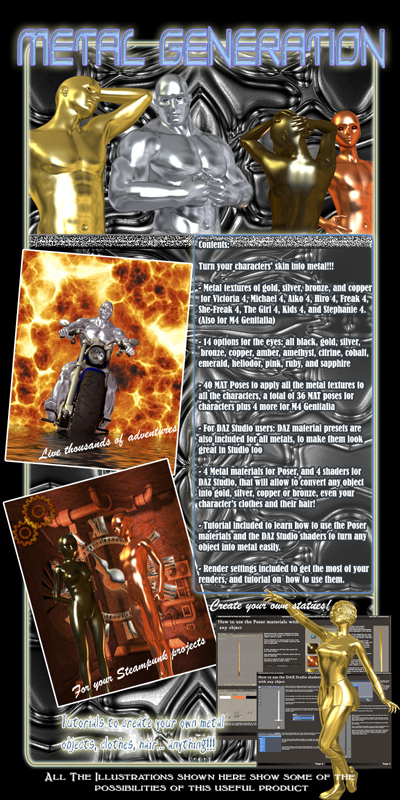 I made this product with my wife (Emma Alvarez) for Renderosity: "Metal Generation". Turn your characters' skin into metal!!! - 4 Metal materials for Poser, and 4 shaders for DAZ Studio, that will allow to convert any object into gold, silver, copper or bronze, even your character’s clothes and their hair! - Tutorial included to learn how to use the Poser materials and the DAZ Studio shaders to turn any object into metal easily.